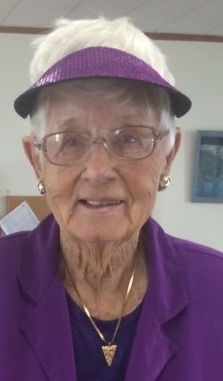 Fay Elizabeth Dennison Downing age 92 of Britton, went to her heavenly home peacefully on February 11, 2019 in Englewood, Florida. She, with her husband Leslie, were Michigan snowbirds and their winter home was in Englewood November through May each year for nearly 39 years. Fay was born at the Dennison Family Farm in Cone on June 25, 1926. Her parents were Helen Jane Olds Dennison and James Conklin Dennison. Her only sister was Ruth Marie Dennison Hanson (Wyman). Her paternal Grandparents were John and Nettie (Sherwood) Dennison, paternal great grandparents were Homer and Martha (Auten) Sherwood. Her Maternal Grandparents were Steven Olds and Lizzie Mueller. They preceded her in death. Fay attended the Cone School where all 8 grades were taught in the one room school house. She was awarded a First place medal in the 1939 Monroe County Spelling Bee Championship and still cherished the medal. Fay graduated from Milan High School in 1943. She married her husband Leslie Downing on February 17, 1945 at a ceremony in the Cone Methodist Church. They lived together in Britton for the past 73 years. Her first job was waitressing at the Willow Run Bomber Plant cafeteria. Most important to her was her marriage to Leslie and raising her 5 children. She was always involved with their sports, bluebird/campfire leadership and being a support wife and partner in the Downing family farm. She loved driving tractor, transporting the grain to the elevator, mowing lawn, and gardening. Being outdoors was her passion. She was also involved in Lenawee County Extension, sewing with the girls, Red Hat Society, CB radios, Motor home travel, motorcycling - with her husband, member of Moose, Elk, VFW and a devoted member of The Britton Congregational Christian Church. She loved the annual travel to Englewood and especially enjoyed the nightly sunsets at the Tiki, kitchen band, and going out to Sunday Breakfast and dinner with family and friends. Fay is survived by her husband Leslie of 73 years. She is also survived by her 5 children, 9 grandchildren and 11 great grandchildren: Linda Cowan of Englewood, Florida; Nancy (Edward) Cecil of Huntersville, NC; Dianne (Howard) Schroeder of Huntersville, NC; Robert (Bonnie) Downing, Britton; Anita (James) Lister, Crossville, Tenn. 9 grandchildren: Jason (Erica) Cowan, Portland, Ore & Jeremy Cowan of Detroit; Kellie (Michael) Campbell, John (Kai-lyn) Schroeder of Mooresville NC; Jessica (Richard) Brady of San Diego, CA; Jamey (Holly) Lister of Detroit. MI; Charley (Karle) Downing of Britton; Patrick (Lisa) Downing of Petersburg; Lezlee Downing of Britton. 11 greatgrandchildren: Michaela, Kimber, Jacob & Christina Cowan of Portland, Ore.; JT, Carson & Emma Schroeder of Mooresville, NC; Megan & Will Campbell of Mooresville, NC; Kelsey and Chase Downing of Britton. She is also survived by her niece Kay Hanson Wansach of Dearborn. Fay was a wonderful, sweet and loving wife, mother, grandmother and great grandmother. She was Aunt Fay to many nieces and nephews. We will all miss her so much. Fay is best known for her love of the color purple and was always wearing purple clothes and a purple visor where ever she went. She was an Icon! Please honor her by wearing purple on this special final day to celebrate her life. In lieu of flowers donations may be made to Britton Congregational Church. Funeral services will be 2:00 P.M. Monday, February 18, 2019 at J. Gilbert Purse Funeral Home, Tecumseh with Pastor Jim Schneck officiating. Burial will follow in Ridgeway Cemetery, Ridgeway. Visitation will be 4:00 - 7:00 P. M. Sunday, February 17, 2019 at the J. Gilbert Purse Funeral Home and from 12:00 - 2:00 P. M. Monday preceding the funeral service. In lieu of flowers, memorial donations may be made to the Britton Congregational Church. Celebration of Fay’s life immediately following Cemetery service will be held at The Britton Congregational Church. Please join us for a light luncheon.